The benefits of sixth-form boarding : The BSA Guide – looking for a UK boarding school? Sixth-form colleges provide high quality academic education for 16- to 18-year-old pupils enabling them to progress to university, the workplace or higher-level vocational education. There are 280 colleges in the UK and 68 are designated as sixth-form colleges, offering an extensive range of academic, technical and professional courses as well as apprenticeships. Sixth-form colleges have a reputation for academic excellence, many of them being rated outstanding by Ofsted. However, they do not have a history of offering boarding accommodation – something we are changing at Richard Huish College in Taunton. While state boarding schools are well established, boarding at a sixth-form college is a relatively rare concept. Each year, state boarding schools regularly outperform other state schools with a good number topping academic league tables around the country. The combination of the excellent state-funded education and a boarding community enables pupils to make the most of their talents and abilities. However, these schools offer Level 2 (GCSE) and Level 3 (A level) qualifications and are for pupils aged 11 to 18, while a sixth-form college is a more adult environment and only has pupils who are between 16 and 19 years. Admission to a state boarding school is mainly for pupils who hold a full UK or European Union passport. Sixth-form colleges and FE colleges can apply for a Tier 4 Sponsor Licence to attract international pupils to study their Level 3 (usually A level) qualifications. Of the 136 state-funded colleges that appear on the Government Register of Tier 4 Visas holders (dated 8 December 2017), 22 are sixth-form colleges. Many of these sixth-forms colleges offer homestay accommodation to their pupils but a few offer full boarding facilities, operated by the college, including Richard Huish College. Several FE colleges offer boarding, but they are still in the minority. At Richard Huish College, based in Taunton, the boarding house opened its doors to pupils from around the world, including the UK, in September 2017. The house has 53 study bedrooms, all with ensuite bathrooms. The College has been welcoming international pupils for many years but knew that while homestay parents do an amazing job of nurturing pupils new to the UK, there were also some pupils who would prefer the boarding house experience. The boarding house means the College can offer choice and flexibility to pupils and their parents – essentially offering an independent school sixth-form experience at a fraction of the cost. Sixth-form boarding at a state college is also an option for UK pupils who travel long distances daily to study at an outstanding college. Flexi-boarding or weekly boarding is a great option when a late sports fixture or exam preparation needs to take priority. Many of our pupils live rurally – parents see the advantages of flexi-boarding while pupils are excited by the opportunity of becoming more independent. Boarding at a sixth-form college, FE college or state boarding school, your son or daughter can expect plenty of home comforts and a warm welcome from the houseparents. Their confidence and independence will be nurtured and the experience will given them essential preparation for university life. Boarding students make a great circle of friends in the boarding house, often friends they will have for life. A rigorous set of Ofsted boarding standards is adhered to, ensuring the pastoral welfare and academic development of all pupils. Boarding at sixth form can be affordable if you expand your search criteria to include the state sector. Many state boarding schools have specific areas of expertise you may wish to access, such as links with Huish Tigers Basketball Club at Richard Huish College. Your child will have the best of both worlds – the benefits of a dynamic college environment bringing together large numbers of talented and aspirational young people who can explore their independence, while still providing a controlled and safe college environment. 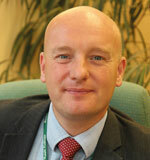 John Abbott has been Principal at Richard Huish College since 2013. He joined Huish in August 2003 as a Faculty Director for Maths and Sciences and was promoted to Assistant Principal in 2009. John is originally from Blackburn, read Sport and Exercise Science at Manchester Metropolitan University and went on to complete a Masters in Sports Psychology and Exercise Physiology. He has two children.